Integrins play an important role in cellular matrix interactions requisite for cancer cell adhesion, growth, migration and invasion. In this study, we have investigated the expression of integrin subunits α3, α6, αv and β1 in normal ovaries, benign ovarian tumors and ovarian carcinomas of different pathological grades. The expression of these integrins in ovarian cancer cell lines was also investigated, and their role in sustaining proliferation, adhesion, migration and invasion in cohort with the activation of signaling pathways in response to extracellular matrices (ECM) was evaluated. We demonstrate a differential expression pattern of α3, α6, αv and β1 integrin subunits in ovarian carcinomas compared to normal ovaries and benign ovarian tumors. Ovarian cancer cell lines (Hey, Ovcar3 and Peo.36) demonstrated significantly high expression of α3, α6, αv and β1 integrin subunits. A significant increase in proliferation and adhesion (P<0.05) in response to collagen 1 (Coll) and laminin (LM), ligands for integrin receptor α3β1 and α6β1 was observed in ovarian cancer cell lines. On the other hand, fibronectin (FN), a receptor for αvβ1 integrin, increased proliferation in all ovarian cancer cell lines studied but only enhanced adhesion in Hey cell line (P<0.05). Neutralizing antibodies against α3, α6, αv and β1 integrin subunits inhibited ECM-induced proliferation, but increased adhesion to ECM was inhibited by β1 integrin subunit antibody. No suppression of Coll, LM and FN-induced (Hey cells only) adhesion was observed in the presence of α3 or αv subunit antibodies but LM-induced adhesion was inhibited by blocking α6 subunit functions. LM, FN and Coll enhanced chemotactic migration in Hey cells, but direct invasion across ECM was observed only in the presence of LM and Coll. Blocking antibodies against α3, α6 and β1 integrin subunits inhibited both chemotactic migration and invasion of Hey cells in response to respective ECM. Adhesion of ovarian cancer cells to FN, Coll and LM activated Ras, Erk and Akt pathways. Neutralizing αv and β1 functions did not inhibit FN-induced activation of Ras and Erk pathways but inhibited the Akt pathway. On the other hand, antibodies against α6 and β1 subunits, but not α3 subunit, inhibited LM-induced activation of Ras but did not inhibit the downstream Akt pathway. Neutralizing β1 subunit function however, inhibited LM-induced Erk activation. Coll-induced activation of Ras, Erk and Akt pathways was inhibited by α3 and β1 integrin subunit antibodies. 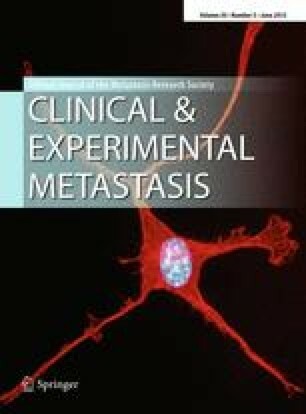 These results indicate that α3β1, αvβ1 and α6β1 integrin mediate proliferation, adhesion, migration and invasion of ovarian cancer cells in response to ECM and targeting these integrins to modulate integrin–ECM interactions in tumor cells may be a promising tool to reduce the dissemination of ovarian carcinoma in vivo.